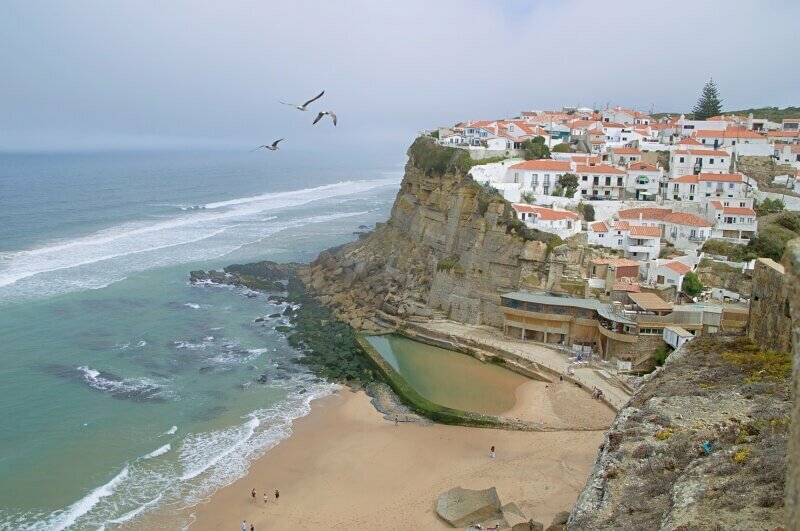 Picture a collection of whitewashed cottages perched on a cliff overlooking a sandy beach and rocky coastline and you’ve got the village of Azenhas do Mar. In fact, you may already have seen images of this charming village within the Sintra-Cascais Natural Park – it’s very photogenic. Mike and I went to see whether it lived up to the romantic imagery and we were not disappointed, despite the morning mist. Our visit started well – we managed to find a parking spot in the small Largo do Padre António plus a seat at the nearby kiosk-café. The cakes, namely the local Sintra delicacies known as travesseiros (a filo pastry roll filled with a sweet egg and almond paste) and queijada da Sintra (a less sweet pastry tart filled with a confection of fresh cheese and cinnamon), were deliciously crisp in the right places and warm. Tip: You can savour these and other tasty local treats on this small group foodie tour of Sintra and surrounds. Suitably fortified, we set off to explore the cobbled streets and narrow staircases between the jumble of low stone cottages. There is a marked walking trail through Azenhas do Mar but we didn’t follow it exactly. Even so, we managed to stumble across a couple of great viewpoints offering views of the sandy cove and dramatic cliffs facing the village. One of the prettiest buildings in Azenhas do Mar is Villa Maria, apparently built in 1934 – look for the house trimmed with blue and decorated with azulejo panels. Just up the street from this beauty, you’ll see a row of mill stones. Azenha means mill and back in the day, the local community had a series of sea-powered water mills which gave the village its name (mar is the Portuguese word for sea). You can see one of these mills behind the bus stop next to Agua e Sal restaurant. To get to the small sandy beach, you need to walk down some fairly steep steps from the roadside car park or the village itself. Once there, you’ll find the cliff base dominated by a glass-fronted restaurant. There are a couple of beach bars too. A low concrete wall in front of the esplanade creates a natural sea water pool that offers safer swimming and paddling for kids. However, it looked rather green and uninviting when we were there, which is probably why the restaurant has built a proper swimming pool. If you want to visit Azenhas do Mar on a guided tour, check this one out: Combine a trip to historical Sintra with time on the most attractive nearby beaches and in Azenhas do Mar. 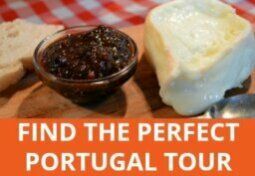 For a fab foodie tour of Sintra’s villages, including Azenhas do Mar, check out this tour by Cooltours Lisbon. 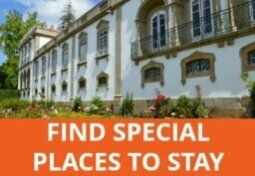 For greater flexibility to explore the surrounding area, natural park and other Sintra beaches, a car would be handy, especially if you plan to stay overnight – see my tips for renting a car in Portugal. Insider tip: If you’re driving here as a day trip from Lisbon, I wouldn’t even try to find a parking space inside the village in summer months – we visited on a September morning when it wasn’t very busy. Instead, head for the car park on your left just before the road starts to curve downhill into the village itself (assuming you are coming from the south). If you’re relying on public transport, there are frequent trains from Lisbon to Sintra and several daily buses (fewer at weekends so plan ahead) to Azenhas. Take a train from Rossio station in Lisbon to Portela de Sintra (note that this is not Sintra old town). Opposite the train station, there is a bus terminal. Bus numbers 440 and 441 go to Azenhas do Mar (see timetables here) and take around 35 minutes. Azen Casa Hotel has quite a sporty theme and is good for families and budget travellers. There’s a lovely glass-fronted lounge and dining area overlooking the gardens. As well as a dorm room, there are two suites that have a double and two single beds. There’s free parking, too. 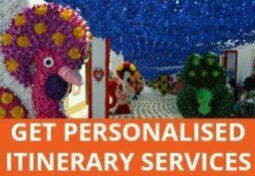 Check prices and availability. 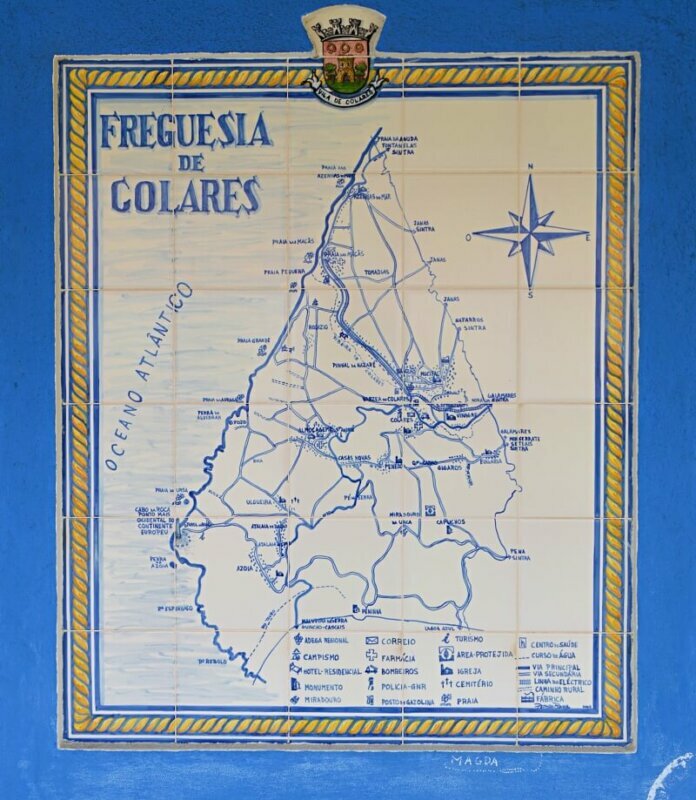 Right behind Villa Maria is a small 2-bedroomed house you can rent for up to 6 people. The fully-equipped kitchen means you can prepare meals on site. Furniture is a somewhat odd combination of modern and traditional but it’s clean and comfortable and couldn’t be more central. See photos and check availability. Another village house for rent offers fabulous views from the tiny terrace. Again, sleeping up to 6 people, it’s got everything you need, including a barbecue. Check prices and availability. Casa nas Arribas is a small, cute cottage that sleeps 4 people and is full of character. With free parking and wifi the cottage overlooks the ocean and is just a short walk from the beach and village. See photos and prices. If you have a car, you could go for the delightful wooden house situated on an organic farm between Azenhas do Mar and another village, called Fontenelas. This cosy property is a perfect countryside getaway and close to the beach. See photos and fall in love. Looking for something original? How about staying in a windmill? This fully furnished and equipped holiday home is on the outskirts of Fontenelas and again makes the most of the combination of beach, countryside and proximity to Sintra and Lisbon. Check out this unique windmill accommodation. If you’d rather stay overnight in a larger town or city, e.g. 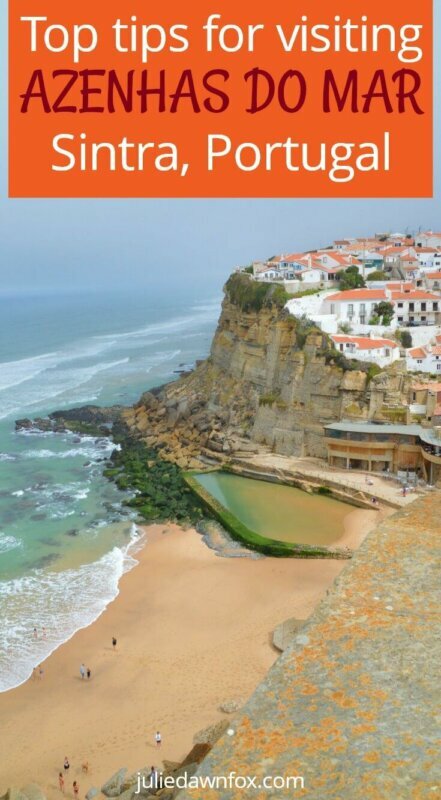 Sintra, Cascais or Lisbon, see my accommodation guides for the Lisbon area. 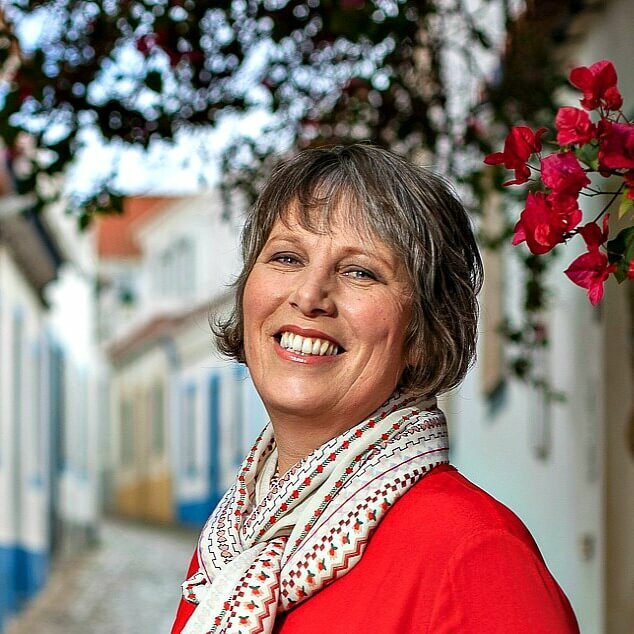 I may well try a visit to a place to be honest I had never heard of .but as i intend this year to visit Lisbon I will certainly consider a trip out to what seems a beautiful village.I very much enjoyed your article thank you…. I hope you enjoy it, Michael. I visited Azenhas in September last year, it’s just such a romantic village. I thought so too, Sami. Wonderful blog, Julie. Thanks for posting it.